Hello Friends! I know you are very excited after reading the title of this post. Yes it is true that you can win a $20/1500rs Amazon Gift Card or Cash In Paytm/Paypal for free. We provided you many useful tricks and tips. 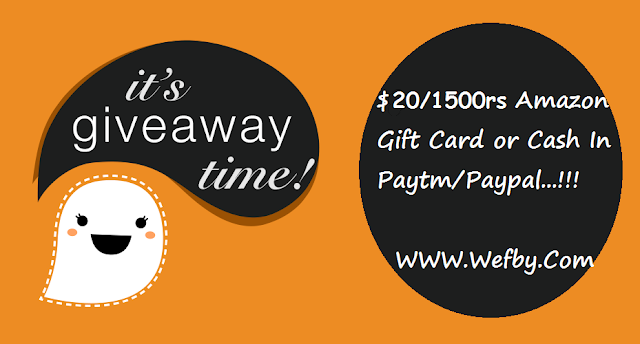 But today we are giving you a chance to win a $20/1500rs Amazon Gift Card or Cash In Paytm/Paypal. You can decide what you want, a gift card or cash. You can easily enter into our competition and can win the prize. The prize is " $20/1500rs Amazon Gift Card or Cash In Paytm/Paypal". It is not a big prize, but may be useful for someone. We are choosing Amazon company because it is very trusted and very fast. It is the biggest online shopping sites. There are many other companies for the domain name but Godaddy is the best. Instead of buying a product for giveaway , we are leaving it on the winner of the competition to buy anything. So lets come to competition. Anyone can participate and join in this competition. It is very easy to join this competition and start compete others. We place a giveaway generator in the end of the post. In this generator you need to login with facebook option. Don’t worry! It is no for any illegal or bad activity but it is only for do the promotion of our new Facebook Autoliker site Wefby.com. Yes! It is all about for promoting "Wefby a facebook autoliker site which gives you 10,000+ likes on your facebook Photo/Status in Free" and the one who promote the most will be chosen as winner. But how we will know that who is doing the most promotion? It is very simple! After login in this generator , For doing each and every task it will gives you point , tasks you need to do is like following us on twitter , liking our facebook fan page , sharing or commenting on blog post or anything else. Different tasks have different points value. So, for become the winner of this competition you have to collect highest points. The main thing that I want to tell you that in the last, you will be given a referral link(best way to earn maximum points) that you have to share with others as much as you can because on each visit from you link will gives points to you. This is a best way to collecting more points because we will give maximum points for this step. After 30 days , this competition will end and after ending the competition, winner will be announced and prize will be given. There will be only 1 winners who will collects the maximum points. Winner will get $20/1500rs Amazon Gift Card or Cash In Paytm/Paypal. Now go and start making points to win this giveaway. Also there is task which gives you maximum points. The task is using our Autoliker site Wefby. Here is a video tutorial on "How To Use Our Autoliker". Just watch it and use autoliker and earn the points. WINNER: The winner is Vivek Thakur. Best of luck to all participant and we hope who are hardly need of this prize will win. Hope you all understand the way of participating but if someone has any question than please feel free to ask in comments box. Now don't waste time because a prize is waiting for you.